This superb collection properly revisits select songs from a wide portfolio, adding respectful guest appearances that accentuate more than not. This record really surprised me. 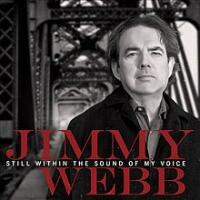 Going into my first listen of the album, I was relatively unfamiliar with Jimmy Webb the performer. Webb's biggest songs are etched into my own personal nostalgia, and the versions I love are the ones that littered the airwaves when their interpreters took them to the top of the pop charts way back when. He's responsible for "Wichita Lineman", "By the Time I Get to Phoenix", "The Worst That Could Happen", "MacArthur Park" ... he's that caliber of songwriter, and the hit versions of these stalwarts speak for themselves. That sentiment has changed upon receiving Still Within the Sound of My Voice. This superb collection properly revisits select songs from a wide portfolio, adding respectful guest appearances that accentuate more than not. Some additional back-story is needed here, as his story floored me when I discovered just how much he has accomplished in his career so far. Jimmy Webb is the only artist to win Grammys for music, lyrics, and orchestration. His songs have been performed by the best of the best, including Glen Campbell, Elvis Presley, the Supremes, Frank Sinatra, Isaac Hayes ... this list is so long, it would comprise an entire paragraph if I were to keep citing. Many awards in many areas have been bestowed upon him, yet he isn't a household name (musicians notably excepted). Webb is worth a Wiki search, followed by a YouTube perusal, followed by a trip to the local record store for some back-catalog purchases. I went about it in that order, and I highly recommend this path to everyone. His music and musical abilities are both true American treasures. Some of the reworkings on Still Within the Sound of My Voice are timeless themselves, and are worth more than a few words of praise. The new take of "MacArthur Park" with Brian Wilson is a far cry from Richard Harris' 1968 classic, and showcases Wilson's prowess as if it were meant to be a part of the Smile sessions ... it's sublimely beautiful. The vocal blending of Webb, David Crosby, and Graham Nash on "If These Walls Could Speak" is gripping and hypnotic, and worth the price of the disc. "Adios" with Amy Grant is no less charming, as is "Shattered" with Art Garfunkel. The pairings on these tracks are well-conceived, and in most cases strong contenders to surpass the brilliance of the original versions. Time will tell. The most praise goes to Webb himself, showing incredible vocal range for his age. His abilities to mesmerize are none diminished, and this benefits a few of the songs as some of his collaborators clearly are having a hard time keeping up. Unlike the latest John Fogerty-and-friends re-hashings, where most of his celeb guests prove beauty over age, Webb flips this hourglass around. He's got the goods, and these goods refill his masterpieces with a new-found passion as if he knows deep down this record will expose him to a bigger audience. It should. Still Within the Sound of My Voice is that good.